The common earthworm is a segmented worm from the phylum Annilida. It has a red-brown colored dorsal surface and a faint yellow ventral surface as well as a distinguished orange-red clitellum close to the reproductive organs. 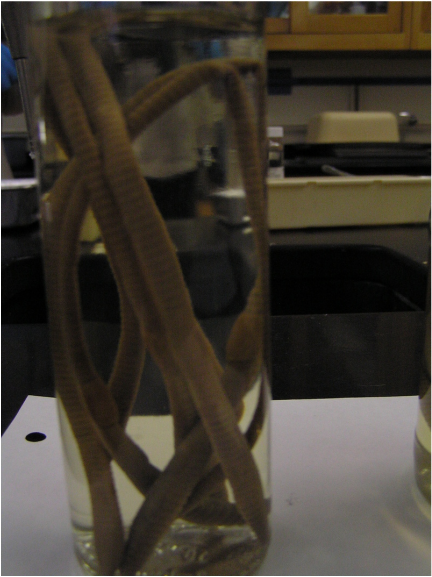 Each segment of the earthworm possesses small hair-like structures called chaetae that are used to help the worm move through the soil. In order to breath, the earthworm can absorb oxygen across the surface of their moist bodies. It can reach a length of 9-30cm and a diameter of 0.6-0.9cm. All earthworms are hermaphroditic, meaning that an individual possesses both male and female reproductive organs. They consume organic matter found in the soil and are important in aeration and fertilization of soil. They also serve as a food source for many mammals and birds. The common earthworm is a terrestrial species and live in the soil in pastures, grasslands, lawns and forests. It is Native to Great Britain and Europe and has been introduced to many other countries, including the United States. The common earthworm is important in keeping soils aerated and fertilized for farmers to grow crops productively. they are also used extensively for bait by anglers and have been used in folk medicine as a remedy for certain illnesses such as stomach pain and tooth aces. "Earthworm (Lubricus terrestris)". Arkive. Retrieved from: http://www.arkive.org/earthworm/lumbricus-terrestris/.